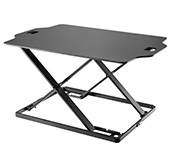 Stand Up Desk Converter- 795 x 540mm - Black - Ships Same Day! 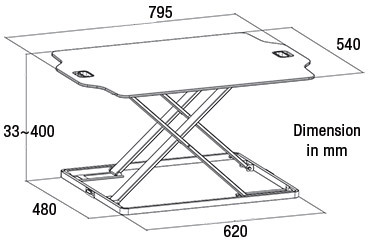 Stand up desk converter has 795 x 540mm top surface area that is 8mm thick! 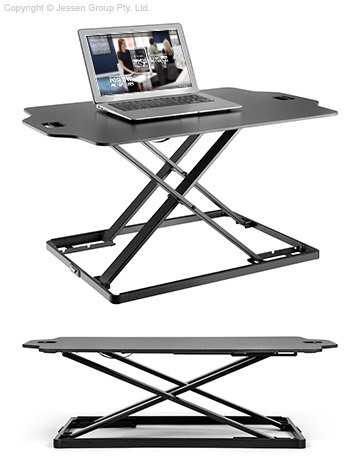 This stand up desk converter helps you turn your existing table into a standing desk, whether at home or the office! These standing desk risers are specifically designed to fit on top of your table with no need to remove existing tales or desks to start having a healthier work day. The 795 x 540mm workstation offers plenty of space to hold your computer and all peripherals, with a total weight allowance of 10kg. The 8mm thick surface is made from HDPE, a durable high density plastic that is water and chemical resistant! This stand up desk converter, one of many conference room and office displays ready for purchase, can have the height placed between 33 & 400mm from the tabletop in 12 set positions. Pull handles set within the table top make switching the heights easy, going from standing to a sitting desk in seconds thanks to the spring assist system. The lightweight display is only 10.7kg as well, making it easily portable to different areas so you can always have a standing desk ready to go. The frame is made from steel with a black powder coat that matches the plastic tabletop. To help prevent scratches to the surface it is placed on, there are rubber feet attached to the base. These feet also prevent the workstation from sliding about during use to ensure stability. Whether for home, office, or school, these standing desks are sure to help you feel better during the day by increasing blood flow. Order by 2pm EST to receive same day Australia-wide despatch when in stock, only from Slimline Warehouse!